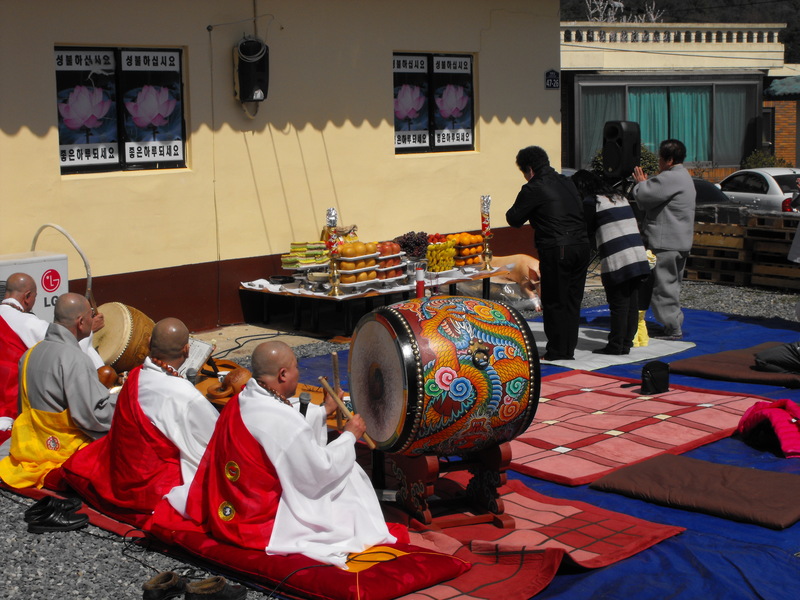 Monks play instruments and chant during ritual to ask local god's protection of the town. There are about a million Buddhist temples in Korea, and it seems like almost every little mountain in the country has at least one. Yesterday the father-in-law thought I might like to go over to the temple nearest the house to watch a ceremony they were holding. So off we went to Gu In Jungsa Temple, taking a shortcut past the cow pen and through the tiny hay-field of the miniature farm out behind the in-laws’ house. Then we went up the road a spell until we came to the small temple. Judging by the noise, the ritual was well under way. Two old men were sitting on chairs just outside the gate. My father-in-law said something to them and gestured towards me. I gave a good deep bow and said, “Ahn yong hasayo,” which is the formal way of saying hello to strangers and those older than you. It is one of the very, very few Korean phrases I have mastered and I enjoy deploying it at pretty much every opportunity. Having astounded the locals with my virtuosity in their own language, we entered the courtyard of the temple, where the ritual was being performed. I learned later the purpose was to ask the god of the mountain to protect the town. 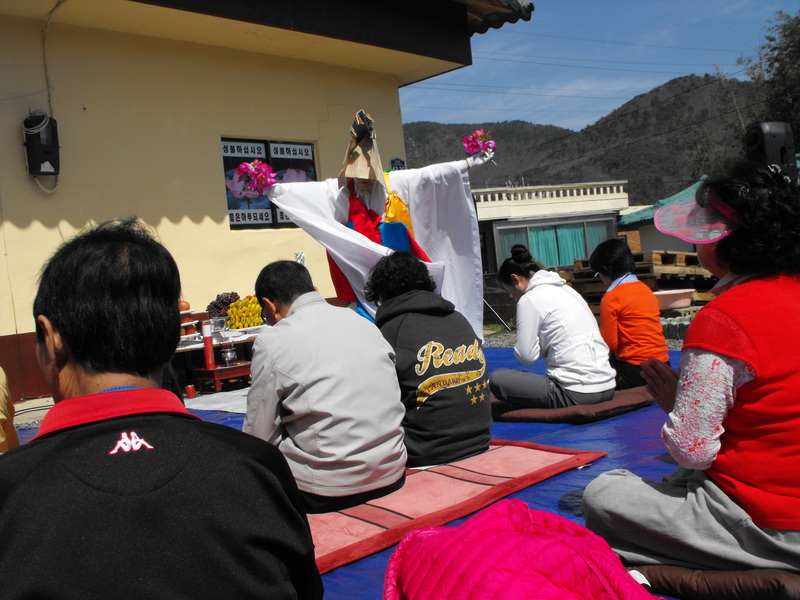 A monk performs sungmoo, the dance to ask the local god to protect the town. At first, it all seemed to be a pretty standard and straight-ahead Buddhist ceremony. There were drums, cymbals, moktaks (a hollow wooden percussion instrument) and chanting. There was a table loaded with offerings to the local deity at the front, the monks were to the left and the congregants were either sitting or bowing to the table or to the monks. Then I noticed something that surprised me: a big dead pig right beside the offering table. I’m no scholar when it comes to Buddhism, but I’m pretty sure there is something in there about not killing animals and the importance of being a vegetarian. I can understand that the rank and file might not follow this teaching, but shouldn’t the monks of a temple? Upon closer inspection, I noticed that the pig had envelopes stuffed in his mouth. Then I saw some folks put 10,000 won notes in his ears (worth about $10). I knew what I would be asking KJ after we got home. Jaymul pig with money offerings stuffed in his mouth and ears. According to KJ, Korean Buddhism has been influenced by the animist traditions that preceded it in this country. 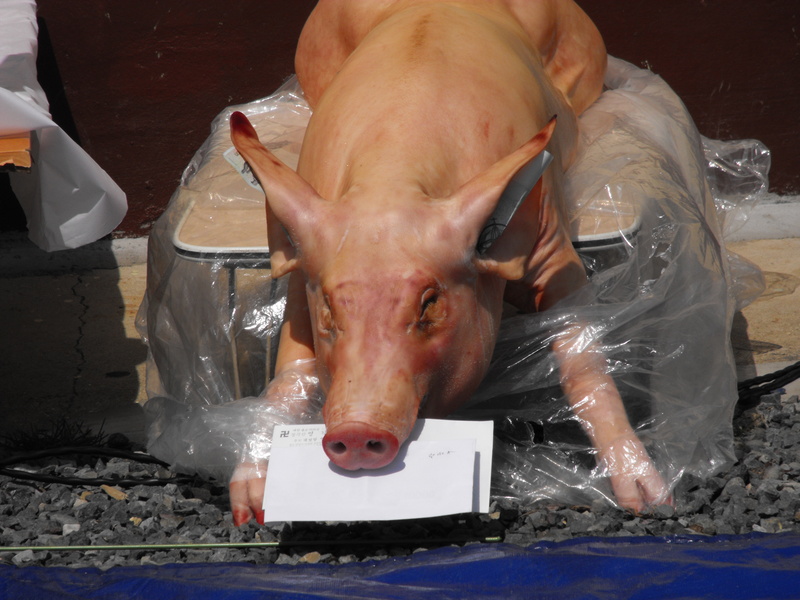 The envelopes in the pig’s mouth contained money and were put there by believers so that their prayers would be answered. Same thing with the money stuffed into his ears. These pigs are pretty important in Korea, apparently. When someone opens a business, they may buy a pig to help bring good luck. Usually it’s just the head, though. The value of these jaymul pigs (offering pigs) is determined by how big its smile is. The bigger the smile, the bigger the luck – and, naturally, the bigger the price. How sacrificing a pig for use in a Buddhist rite gets reconciled with the teaching of the Buddha and the sages who followed him is something I do not yet know. All I know right now is I’m looking forward to the opportunity to find out. more info about the issue and found most individuals will go along with your views on this sіte. to read moгe of your useful іnformation. Thanks foг the ρost. look for. Yοu’ve ended my 4 day lօng hunt! God Bless you man. Have a grеat day.